As promised, some other images and ideas from the Showcase House in beautiful San Francisco, CA. 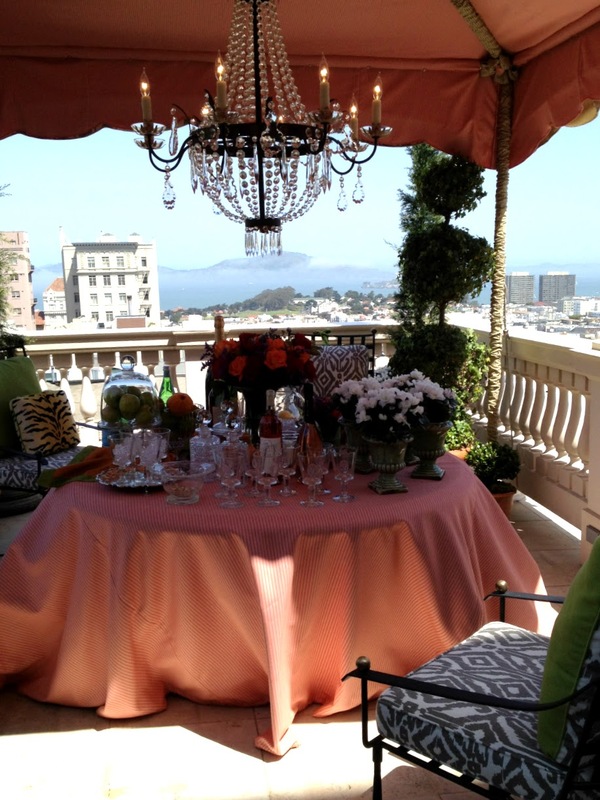 The Showcase was situated in Laurel Heights, which is one of the most beautiful enclaves in SF. There’s a lot of history in this area – and the surrounding houses show it. One of the most lovely areas was the upstairs terrace. I could have stayed there all day! It had views that went on forever of the area but the decorations on the terrace itself were so incredibly gorgeous. I just loved this furniture from the Barlett Collection with these tiger striped ottomans with the green and coral fabrics. I loved this 1920s marble console, which the designer aged by painting over the original brass base. Purists would say “Don’t touch it!” but I think it looks great and in keeping with the theme and color fo the terrace. Beautiful job! I love the old watering can with the hydrangeas spilling out – I have been thinking of doing this with an antique red watering can that I bought recently at the New York Gift Show. The picture above doesn’t really do it justice – but it was a lovely vignette with wallpapered walls of Osborn & Little/Designer’s Guild Nubucco Gold Watelet Wallpaper. Once inside it was difficult to tell which was was in and which way was out! There was soft music playing and wonderful mood lighting. I loved it. Another unusal room was the upper floor powder room. I stayed inside this room for a while because it was really so unique. The mirror was a work of art. The designers, Joe McGuire and Sophia Kabler Cowley of KCS Inc, wanted to blur the typical lines of mirror and vanity and so they created this mosaic of tile and mirror on the wall. The mirror cuts away to reveal “Tacciato Diva” tile by Walker Zanger. This artistic feat must have taken many days to do – it was really beautiful. Another unusual room was the first floor bathroom. This was a” bathroom as gallery.” created by Ma(i)sonry designers, Michael Polenske and Carissa Duncan. It featured a chandelier made of an umbrella with “airport-confiscated” scissors hanging from it and a clawfoot tub filled with scissors. This room also featured repurposed fixtures and petrified wood – as well as antique books and other treasure (notably a sculpture made from book pages). Another very unusual room was the Dining Room. I could have stayed there for hours, just eyeing all the beautiful changes and designs in this room. Created byMarysia Rybock of Scavullo Design, this very clearly grand, Victorian architectural space was transformed into a modern and informal place to eat and entertain. 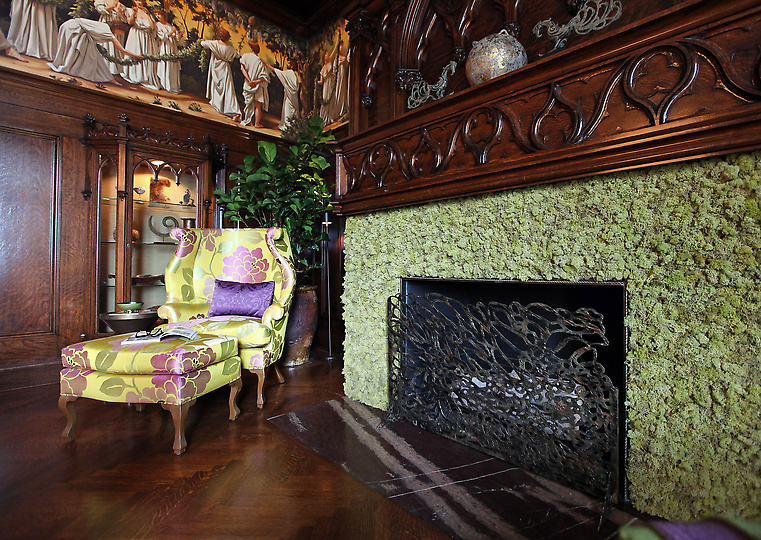 Also note, the room was sporting some high chairs and splashes of purple/lilac – which I found in many of the rooms in the Showcase. Another fabulous room that was out of the ordinary was the “Teen Only Hang Out Room,” designed by Emily Meghannam of EM Design Interiors. 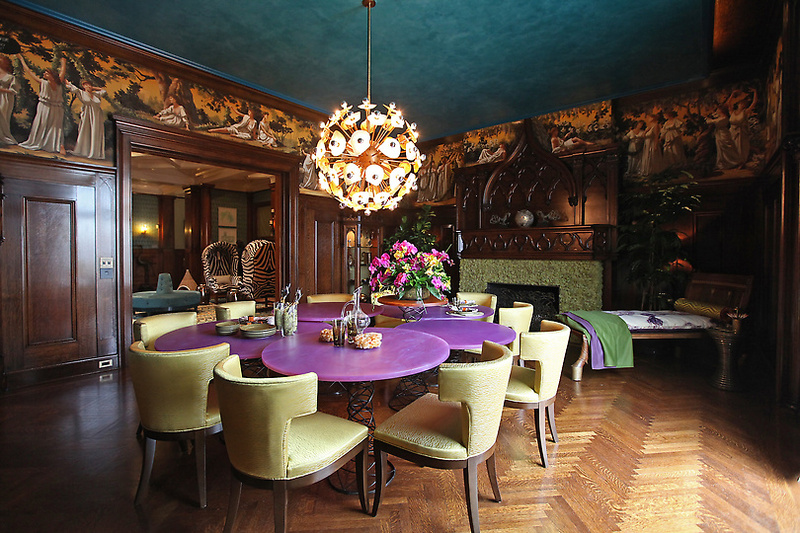 Just one look at the ceiling’s removable wallpaper and the funky chandelier, you knew you were in for a unique treat. I am a new fan! Thank you for sharing these fabulous photographs. The leopard print fabric on the outdoor stools is what first caught my eye. From then on I was like a kid in a candy store. With these pics you have inspired me. I'd love to recreate the umbrella light fixture, but sans the scissors. As for mirror in the bathroom, that is a work of art. 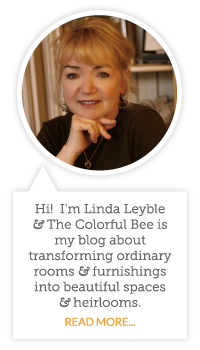 I look forward to following your blog! Very inspirational ! You have a great job! I am a new follower! Would you like to follow me back? Hi Adelins. I have a friend with your name. I have not heard of it before – very unusual. Perfect for you, who wants to stand out from the crowd! Thanks for your comments. I will follow you as well. If i gave a dollar for the amount of wonderful articles you've got written you would be rich. Just thought i would let you know how grateful i am. I am visiting from your comment left on my post on vintage postcards. I had to take a few minutes to browse through your posts and landed here in dreamland! I love the bathroom as art. 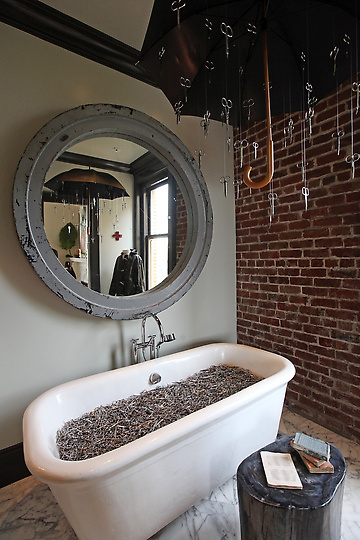 The umbrella chandelier, the tub of scissors, that mirror – how totally unique. Thanks for sharing this trip with us. I am following you back.